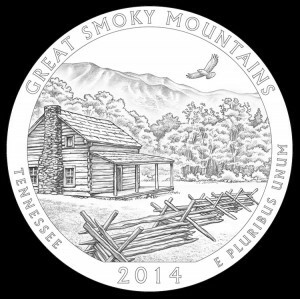 Final designs for the 2014 America the Beautiful Quarters have been announced by the United States Mint. Release dates for the 2014 America the Beautiful Quarters have not been announced but they will be issued in intervals throughout the year. In addition to the quarters, the same designs will also appear on strikes in two related programs — the 2014 America the Beautiful Five Ounce Silver Uncirculated Coins and the 2014 America the Beautiful Five Ounce Silver Bullion Coins. Both series feature coins struck from five ounces of .999 fine silver to a diameter of three inches. The uncirculated coins are produced for collectors and sold directly to the public by the U.S. Mint. In contrast, the bullion coins are investment grade products and sold through the Mint’s network of authorized purchasers for a small premium above the spot price of silver. Offered below are images of the five designs selected for the 2014 America the Beautiful Quarters and five ounce silver coins, plus a short description of each. Central to the reverse of the quarters and coins is a historic log cabin found within the boundaries of the Great Smoky Mountains National Park. A hawk is seen circling above. A lush green forest of the region is in the backdrop. Inscriptions surrounding the design include GREAT SMOKY MOUNTAINS, TENNESSEE, 2014 and E PLURIBUS UNUM. Artistic credit for the image goes to Chris Costello with sculpting completed by Renata Gordon. Shenandoah National Park quarters and five ounce silver coins will have an image of a day hiker as he takes in the view offered at Little Stony Man summit. 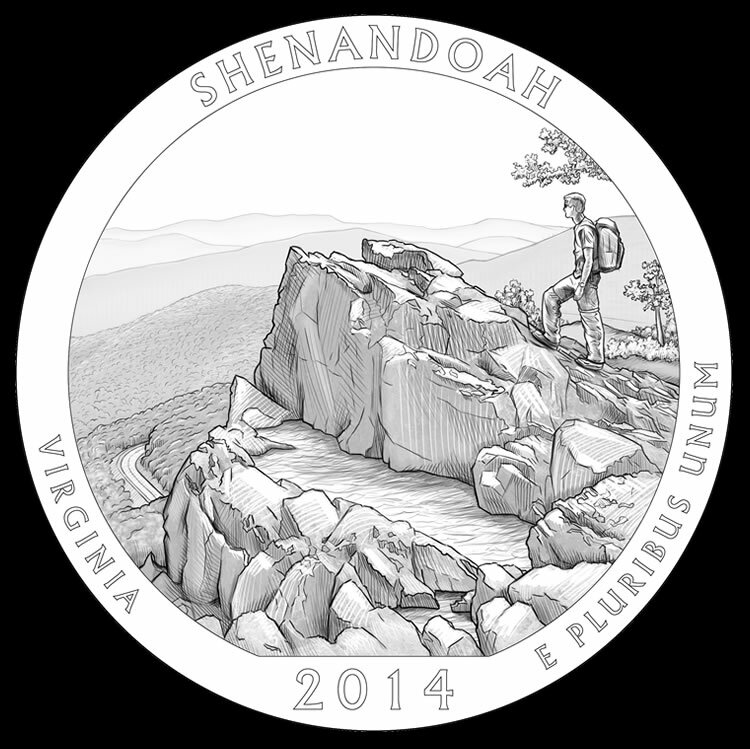 Around the design are inscriptions of SHENANDOAH, VIRGINIA, 2014 and E PLURIBUS UNUM. United States Mint Designer/Engraver Phebe Hemphill created the design and is also responsible for the sculpting. 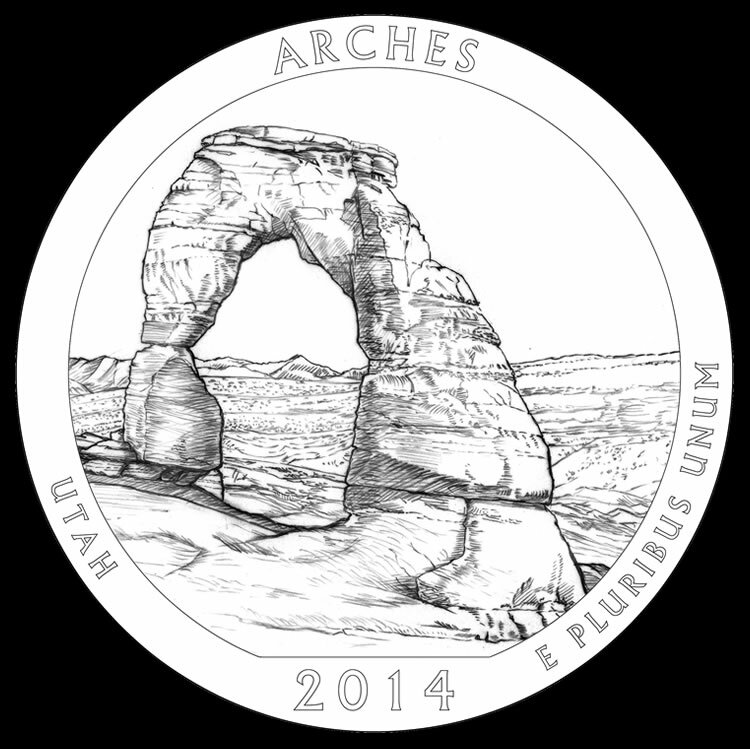 Reverses of Arches National Park quarters and five ounce silver coins will depict Delicate Arch, one of the most famous sandstone arches of the park. In the distance, the La Sal Mountains appear. Reverse inscriptions include ARCHES, UTAH, 2014 and E PLURIBUS UNUM. Donna Weaver is the artist of record for the reverse image with sculpting credited to Charles L. Vickers. For Great Sand Dunes National Park quarters and five ounce silver coins, a father and son are shown playing in the sand next to a creek bed. In the background, the mountains and sand dunes of the region appear. 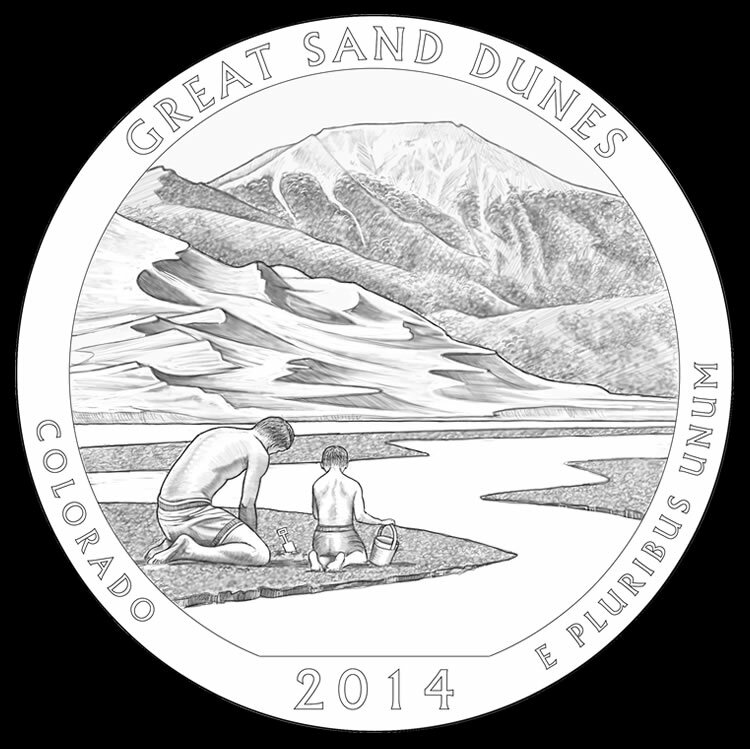 Inscriptions surrounding the design include GREAT SAND DUNES, COLORADO, 2014 and E PLURIBUS UNUM. The reverse image is the work of U.S. Mint artist Don Everhart. He also sculpted the design. Two water birds are shown on the reverse design of the Everglades National Park quarter and five ounce silver coins. An anhinga in the foreground is depicted with outstretched wings on a willow tree while a roseate spoonbill is further in the distance. 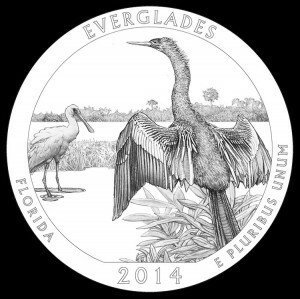 Reverse inscriptions include EVERGLADES, FLORIDA, 2014 and E PLURIBUS UNUM. Joel Iskowitz designed the reverse image of the quarter dollar with Joseph Menna sculpting. Obverses of all America the Beautiful related coinage feature the same portrait of George Washington. The likeness of the first President of the United States was designed by John Flanagan and was first featured on quarter-dollars in 1932. With minor variations, it has been in use on the quarters ever since. Inscriptions are also shared among the various coins, which include UNITED STATES OF AMERICA, LIBERTY, IN GOD WE TRUST and QUARTER DOLLAR. Each quarter features a reeded edge. The five ounce silver coins have an edge inscription of 999 FINE SILVER 5.0 OUNCE. The America the Beautiful Quarters® Program debuted from the United States Mint in 2010 and was authorized by congress under the America’s Beautiful National Parks Quarter Dollar Coin Act of 2008 (Public Law 110-456). Five new strikes are released annually as part of the series with each honoring a different site of national interest from around the United States and its territories. Coins of the program are released in the order in which the honored site came under the direct control of the federal government. When completed in 2021, a total of fifty-six new coin designs will have been featured.